Boost Mobile, a pay-as-you-go subsidiary of Sprint, is set to add yet another Android-powered device to its lineup: the Samsung Transform Ultra. Like most other Boost phones, the Transform Ultra isn't as powerful as something that you'll find a post-paid carrier, but the lack of a required agreement makes this a very attractive product nonetheless. As I said, it's far from a powerhouse, but it's nothing to scoff at, either. For anyone looking to grab a decent mid-range QWERTY device and leave the contract behind, the Transform Ultra is definitely the way to go. It will be available on October 7th for a mere $230. IRVINE, Calif. (BUSINESS WIRE), September 15, 2011 - Boost Mobile, ranked Highest in Customer Service Performance and Purchase Experience among Non-Contract Wireless Providers by J.D. Power and Associates1, once again enhances its smartphone lineup of Android™ devices with the launch of the Samsung Transform™ Ultra. The Transform Ultra complements the existing Samsung Galaxy Prevail™, which in four months has become the best-selling no-contract smartphone in Samsung’s history. The Transform Ultra is the perfect device for the consumer who desires an Android touchscreen along with a text-friendly full QWERTY keypad. The Transform Ultra, powered by Android 2.3 Gingerbread, features access to Google Mobile™ services and more than 250,000 applications through Android Market. 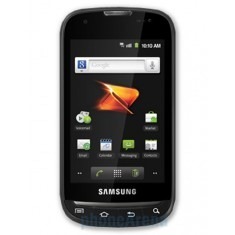 The device has a 1GHz processor, a 3MP rear-facing camera, and VGA front-facing camera for video chat while on the go. The Transform Ultra is Boost’s first Android-powered smartphone to come preloaded with Mobile ID, an exclusive service from Boost that allows customers to download and install “ID packs.” The packs deliver a complete mobile experience, including applications, widgets, ringtones and wallpapers, in a couple simple clicks. ID packs are designed to meet a customer’s individual lifestyle or interests, such as sports, entertainment, fitness and music. As only one example, the MTV Music pack is a complete music experience, bringing together the best music and pop culture apps, widgets and content on your Boost smartphone. The MTV Music pack gives customers access to the biggest stars and newest artists around the clock. Plus MTV has selected the best music apps to stream, download, identify, search and discover all your favorite music. Other ID packs that can be loaded on the device include: E!, Socially Connected, Professional, Entertainment, Lo2Yo Latino, Lo2Yo Mujer and Lo2Yo Futbol. 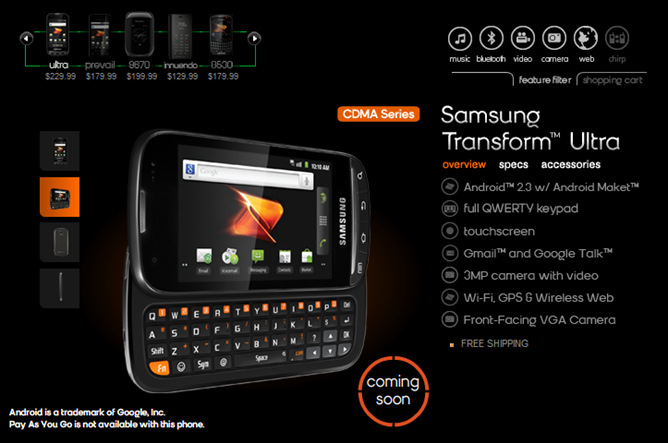 Samsung Transform Ultra will be available Oct. 7 for $229.99 (excluding taxes) at Boost Mobile’s exclusive retail stores, select independent wireless dealer locations across the country and at www.boostmobile.com with free shipping. The Transform will be rolling out in select retails nationwide later this year. Effective Oct. 6, Boost Mobile will add an additional $5 monthly charge for unlimited data and messaging services offered on Android-powered devices. Like the existing Monthly Unlimited plan, the new Android plan includes unlimited nationwide talk, text, Web, email and calls to 411. In addition, the new Android Monthly Unlimited plan will still come with shrinking payments where the longer you stay, the less you pay. For every six on-time payments, the cost of a new customer’s Android Monthly Unlimited plan will shrink by $5, eventually getting down to as low as $40 a month, only $5 more than the current Monthly Unlimited with Shrinkage. Payments do not need to be consecutive to qualify for the next savings milestone. For our current Monthly Unlimited customers, we hear you! Existing $50 Monthly Unlimited customers with Android devices as of Oct. 6 can keep their current price plan as long as they don’t let their account expire. Existing Monthly Unlimited customers upgrading to a CDMA Android-powered device on or after Oct. 6, will add a $5 monthly charge on their current monthly payment without losing any of their accrued Shrinkage savings. Customers can also protect their Samsung Transform Ultra with Phone Insurance that is now available for Boost Monthly Unlimited customers. For $5 per month customers are covered if their device breaks, is lost, stolen or damaged – even by liquid. Go to www.boostmobile.com for more information.